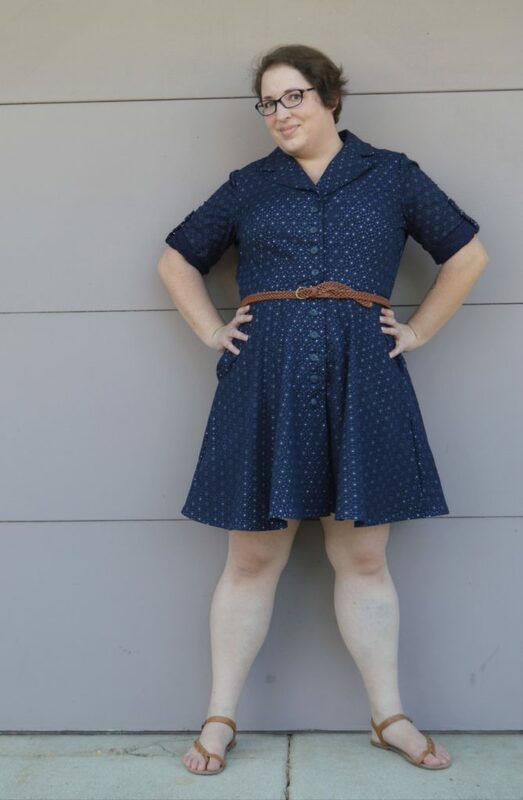 Hey Sewists! Sorry I have been gone so long. 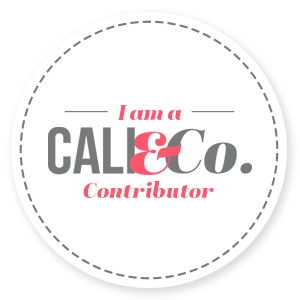 I did not intend to take a nearly two month hiatus from blogging. But, boy oh boy, have I been busy. I have been enjoying my summer and am a little sad to see it leave. I have so many projects to share with you though. Right now I am in the midst of costume sewing for our annual trek to the Ohio Renaissance Festival. Until then, I am excited to be a stop in the Sew Long Summer tour the Melissa is hosting. Today I am excited to share my new shirt-dress obsession with you! I fully intended to blog about these dresses way back in July, but summer happened. Even still, I think shirt-dresses are the perfect seasonal transition garment for me. 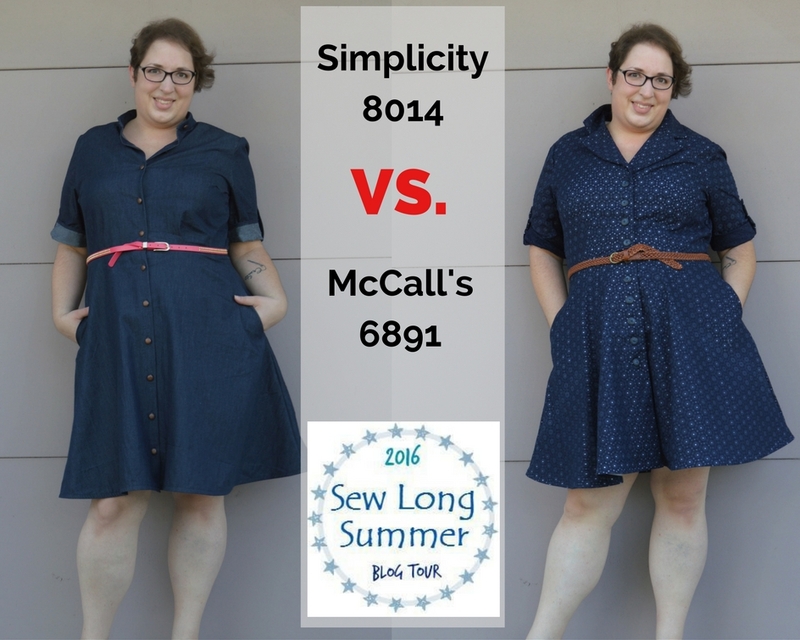 This is my side by side comparison of two similar patterns, McCall’s 6891 view B and Simplicity 8014 view B. Each finished garment was compared in four different categories: fabric used and pattern description, construction, alterations and fit, and wearability. 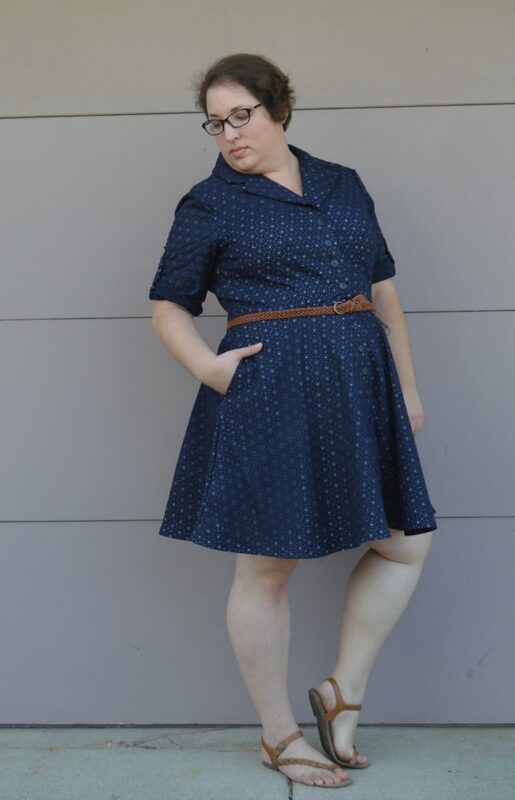 First up, Simplicity 8014! This pattern comes with several different collar, sleeve, length and skirt variations. I chose to make view B with the flared skirt with mandarin collar. For this version I used 2.5 yards of dark indigo chambray from my stash. This fabric was purchased from Jo-Ann’s last year during their Black Friday sale for $11.25. I also used 13 – 5/8″ copper shank buttons, also purchased from Jo-Ann’s this year. Unfortunately, I didn’t keep track of how much I paid for the buttons. I bought them when one of the local stores was closing, so I know I got them for at least 50% off. I really liked the idea of a mandarin collar and thought it would be a great way to give this dress a different look than it’s competitor (M6891). This pattern features pleats at the waist of the front and back, with bust darts and a back yoke. I absolutely love the back yoke! That makes it feel more shirt like for me. Now the challenger, McCall’s 6891 view B. This pattern features a notched collar with various skirt lengths and sleeve types. The bodice features darts for at both the front and back waist as well as the bust. For this version I used 3.25 yards of navy cotton eyelet and 4 yards of white Kona cotton solid, both purchased from Jo-Ann’s this year. Total cost for both fabrics was $37.71. I also used 12 – 7/8″ navy buttons. For my McCall’s version I underlined every piece, except the sleeves, since I chose an eyelet. That doubled the fabric needed and time spent sewing. Underlining was well worth the extra effort. I love the effect of the contrasting white underlining peaking through the navy eyelet. Once underlined, the pattern went together pretty quickly. I finished this dress in a weekend. I used 1/2″ horsehair braid in the hem to give it more volume and structure in its drape. The double thickness of the fabric and the horsehair make the skirt look great! For the Simplicity chambray version it also went together very quickly. I finished this one within a couple of days as well. I used the 1/2″ horsehair braid in the hem for the same reasons as the other version. While you cannot tell from the pictures, it did not sew as easily as it did in the eyelet. With the chambray it has some roping in a few spots because of the curve. Interesting fact, the button holes on the Simplicity version are meant to be sewn vertically, while the McCall’s version are horizontal. For the Simplicity version, the most significant alteration I made was to the sleeve length. This pattern only came with a long sleeve that rolls up to 3/4 length. I knew if I was putting in the sleeve tabs I would never wear this with the sleeves unrolled, so I chose to make a shorter length more similar to the McCall’s version. I love what the back yoke does to draw visual interest to the back of the dress, creating a more tailored fit. I do not think the waist pleats add anything to fit though. From the back I think the pleats are the cause of the bagginess. I think that if they were darts it would look much better. For the McCall’s version the only alteration I made was to the size and quantity of buttons. This was because I could not find any 5/8″ buttons, which is what the pattern calls for, that I thought looked good with this fabric. So, the 7/8″ buttons won out. I added 2 extra buttons, changing the spacing between each one from what the pattern guide is. The fit of this one is spot on though! I love the shaping the darts give. I do not like where the button placement stops in the front for this version. I think another two buttons could be added to make me feel more secure that it won’t fly open. I also do not like the length of this skirt. It is about 2″ shorter than the Simplicity version, making it just above my comfort zone. I really enjoyed wearing the McCall’s dress. The double layers of cotton do make it heavier and warmer to wear. It will be great for fall for that reason, but right now it is still a bit to warm here for me to want to wear it all summer. I am definitely going to have to add two more buttons to the skirt. I was a bit nervous while wearing this all day of it flying open below that last button. The Simplicity was much more comfortable to wear all day since the buttons and hem length were just right. I can say that I am not as big of fan of this mandarin collar as I had hoped to be. The pattern calls for button all the way up with one finishing on the collar. It was a bit too uncomfortable for me to wear all the way closed. I wasn’t a big fan of leaving it unbuttoned though because I think that the neckline naturally drapes a little weird when unbuttoned. Other than that I loved wearing the chambray all day. It is the perfect lightweight fabric to wear on warmer summer days that will pair well with sweaters or tights for cooler fall days. When it comes down to the pattern itself, it was an easy choice to pick a winner. The initial fit of this version is so much better than the Simplicity version. There would be no alterations need for the fit of the bodice. The only alterations I would have to make are to the length of the skirt and amount of buttons in front. Those things are minor in comparison to changing the pleats of the Simplicity version. Then there is the collar! 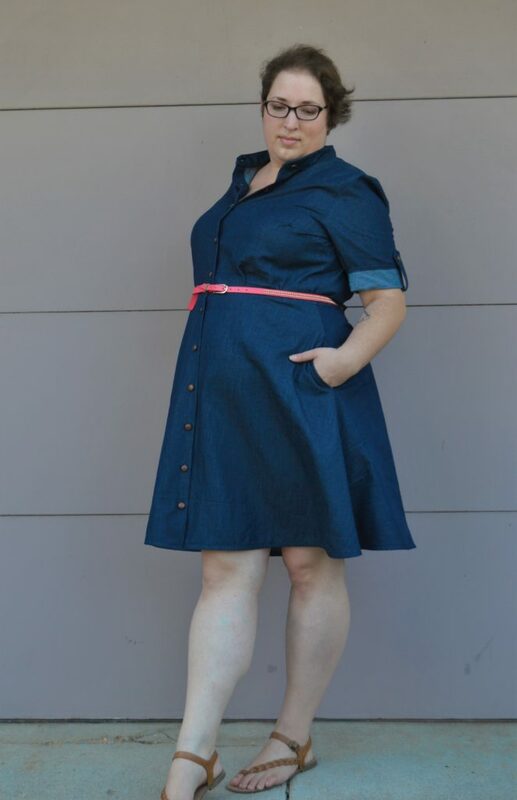 That mandarin collar on the Simplicity dress is just not as flattering as the notched collar of the McCall’s dress. Have you stitched up your own version of either of these patterns? What did you think of it? Check out some of the other stops today on the Sew Long Summer tour and sew along with us. 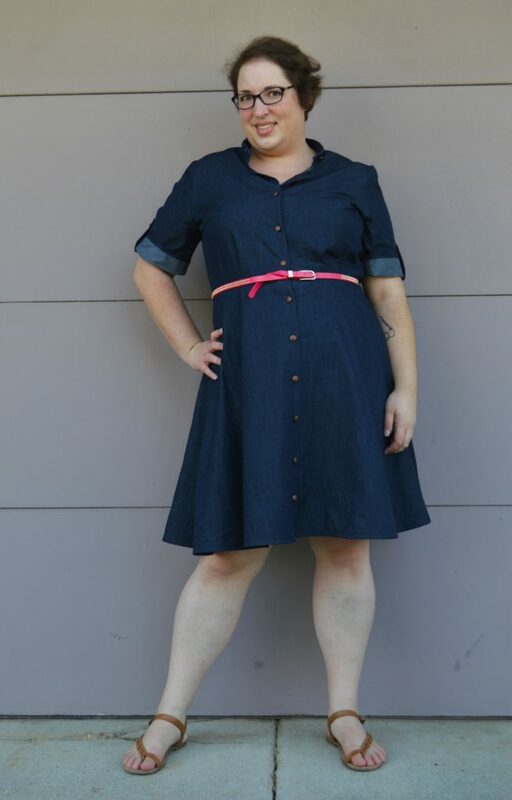 This entry was posted in Sewing and tagged chambray, eyelet, McCall's 6891, sew long summer, Shirt dress, Simplicity 8014, versus. Bookmark the permalink. Great review Sarah! 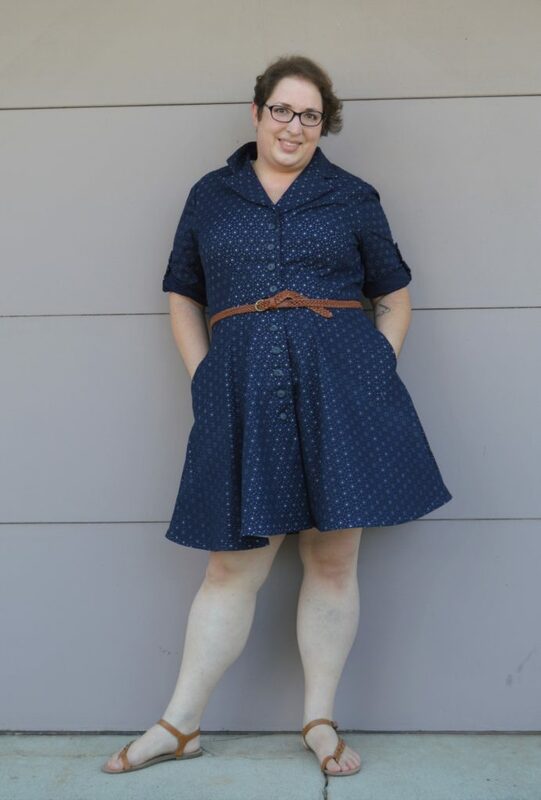 I like the McCalls dress better too. I like a mandarin collar, but the notched collar really looks better and helps give more overall balance to the dress. From first look I thought you had used a printed fabric, but using a contrasting underlining is a nice idea. Thanks! I really should have taken a close up of the eyelet fabric. There is a print on it as well that is really pretty and works perfectly with the eyelet, but you cannot see it in these pics. I *love* my S8014 but went with the collar because I’ve learned that my neck is just too short for the mandarin style collar. But I REALLY love the McCall’s here! The notched collar works and the eyelet is so pretty! I think I may try the S8014 again with the collar instead. I really want to make a plaid shirt dress next! I love them both! They look comfy, pretty and put well together! Thanks! They definitely are comfy. I recommend trying both. This is such a flattering pattern on you. I keep meaning to make more button down dresses. I love the smaller buttons. It makes it more subtle. 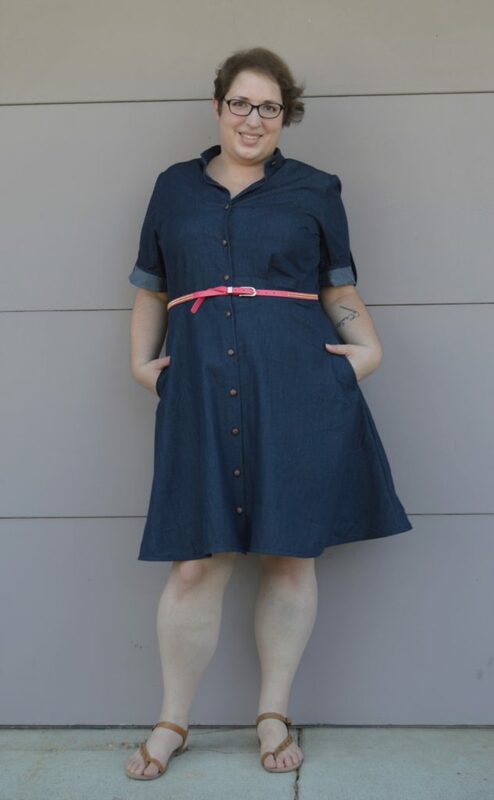 It’s too easy to make a shirt dress that looks like there’s a belt on a man’s shirt. This is so feminine though – Definate hit! Thanks! More flare in the skirt was a requirement for just that reason. I didn’t want to look like I put on one of my husbands shirts. You look great in both patterns. I loved your contrast underlining. It reminded me of underlining my daughter’s wedding dress-lace with silk under. After hand basting one of the 14 skirt pieces, I went to my old days of gluing them together in the seam allowances with a fabric glue. I spaced the dots of glue about3” apart and let them dry for about 30 min. while I did something else. It worked great for underlining. Also loved that you used horsehair in the hem. And, I am impress with the fit. Great job. Whew! I don’t blame you for gluing them! I cannot imagine hand basting 14 skirt pieces! I like them both, and the mandarin collar too. I get your point it is hard to get the collar sitting right while wearing it, I wouldn’t button it all the way up either. I thought you had used a print fabric on the McCalls dress but the contrasting lining is a great idea! Thanks! I like it too, but I think next time I will make it a little shorter than my neck opening so it doesn’t have to be buttoned all the way up. What a great idea to make two dresses with patterns from different pattern makers that are almost identical. And there was also a winner for you. I still hope you enjoy both of them, because both dresses suits you well. Thanks, but I cannot take credit for the idea. Melissa of Mahlica Designs did a whole series earlier this year that I fell in love with. It was fun to do my own version of it. So cute and I love the fabric choices! Love both these dresses and the the fabrics you chose, so perfect!! Thanks! Ooh have fun sewing it! Great tips! Thanks for sharing Pati!